Needless to say those gone are the days when Volkswagen Beetle used to be a popular choice for off-road utility. No doubt for this designation as the Volkswagen model was cheap, light and easy. However company for the year 2016 is bringing the old ‘Baja Bugs’ with a new special edition model Volkswagen Beetle Dune 2016. The concept of this model was presented at the 2014 Detroit auto show under the badge 2014 Dune Concept. 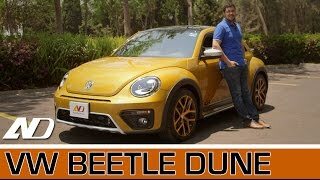 Let us have a look at the review of Volkswagen Beetle Dune 2016 to know in detail about the specifications and performance figures. The interior of Volkswagen Beetle Dune 2016 is very much similar to the most of the models under this badge. The dash and door panels keep the same legacy while the sports seats come with orange stitching adding to the contrast. The same saga continues to the three-spoke steering wheel and shifter boot, making the model unique. Talking about the technology upgrades, it has company’s latest MIB II infotainment system getting featured through a 6.3 inch touch screen and gesture controls. Not only has this company also provides its buyers an option to get features like dual-zone climate controls and a sunroof. 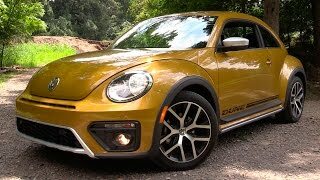 Thus rounding up the interior details of Volkswagen Beetle Dune 2016 all I would say, though less in number but the changes so made with the list of options make the model worth a special look. 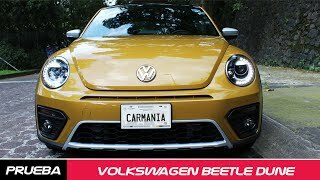 As I mentioned earlier that the model has been designed to bring the Baja Bugs back, the exterior of Volkswagen Beetle Dune 2016 will give you the same clues. The running boards are removed while the fenders are cut away slightly so as to make some extra space for the wheels. The wheels are fitted pretty sportingly beneath the black highlighted arches. The ‘Dune’ graphics can be noticed on both the sides of the car while silver trim work can be noticed around the bottom. Getting to the front end of the model, the traditional grille gets attractive surrounds and mock skid plate. Black honeycomb mesh can be noticed around the fog lights while bi-xenon headlights and daytime running lights are in the list of option. 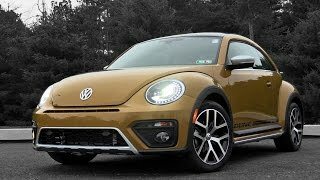 In all the exterior of Volkswagen Beetle Dune 2016 undoubtedly has clues that make it distinct and a special edition model. 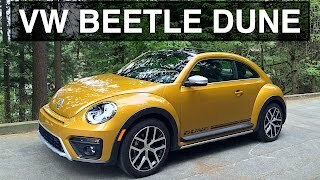 Beneath the hood of Volkswagen Beetle Dune 2016 will be the same 1.8 liter turbocharged four-cylinder engine generating total output of 170 hp and peak torque of 250 nm mating to six-speed automatic transmission. The performance figures of Volkswagen Beetle Dune 2016 are not yet revealed but we assure you to share them with you as soon as company unwraps the details.